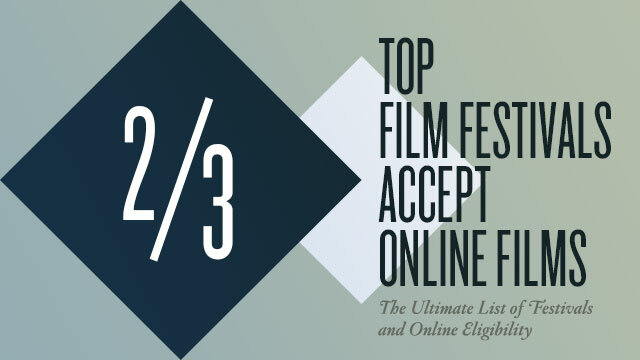 While many filmmakers think that exhibiting your short film online will disqualify it from screening at the world’s biggest film festivals, the truth is that 2/3 of the top film festivals now accept films regardless of their online status. You no longer have to choose between festivals or online. You can do both with a strategy we recommend for our filmmakers called Be Everywhere All At Once. Purpose: Provide a summary of the online eligibility guidelines of the top film festivals to help filmmakers develop the best release strategy for their film. The information in the table has been collected through contacts, submission guidelines and festival rules and regulations (on official websites, Withoutabox & FilmFreeway). This is a dynamic resource that we continue to update with additional festivals and as rules change. If there’s a festival you’d like to see added to this list, or if you represent a festival and the information is erroneous, please leave a comment below. Inclusion on this list is not an endorsement of the festival. The core of this list are Oscar-qualifying festivals and a few other handpicked events that we’ve deemed to be significant reputationally, based on our expertise in this space. This list is a guide and not a direct reflection of a festival’s standing rules. Rules change. Festivals evolve. For any festival of interest, we encourage you to confirm their submission guidelines yourself. To do this, click on the link provided in the ‘Submission Rules’ column. Be sure to check these guidelines carefully, some are very transparent, whilst others are more complex. We’ve moved the list to Airtable which offers filmmakers the ability to sort, group by attributes like location, and even search the list for specific festivals! We have cross-checked every festival in the original list to ensure we are reflecting their latest online guidelines, and have added quite a few more including a number of European festivals. Also updated are the Oscar rules to reflect the latest wording which finally does away with the requirement that a film win an award at a qualifying festival before any public (online) exhibition. Now it doesn’t matter! We’ve added a Rules & Regulations section to spell some of the nuances that festivals have when considering online films. It’s not always a simple ‘yes’ or ‘no’. Finally, we’ve reformatted this post to separate the list of festivals and rules which we plan to keep up to date from some of the original conclusions and updates which will live right here in this running changelog. However, prior exposure does matter—if your film has already exploded online, there’s a chance that a festival will be less interested in screening it. Programming is subjective, and, after all, some festivals do want to maintain a sense of exclusivity that a viral sensation would inherently negate. Yet, the opposite can also be true—it’s becoming increasingly common for films to be selected for festivals because they’ve done well online. Many medium and smaller festivals that have difficulty competing for entries are reaching out to filmmakers directly. Its not uncommon for a filmmaker to receive dozens of requests for their film after they’ve posted it online—many of the fests willing to forgo entry fees. Both of these points stem from a humbling observation—the world is a big place. Even if your film has received thousands of views online, odds are that not a single member of the audience that attends your festival screening has seen it. And it seems that things are only going to continue in this direction. As more short narrative content continues to flood online, and as more audiences turn to the web for the greatest stories, even the strictest of festivals will need to revise their rules or risk being left behind. * Special thanks to Katie Metcalfe (curator for the Sundance Film Festival and Commissioner for NOWNESS) for her initial help in compiling the list.